Quite a few Marsh Frogs at Dungeness- some showing well near the visitor centre. About a week or so after the spawn appeared the frogs all vanished. Now, they seem to be reappearing...they like to hang out in the pond baskets or sit around the edge of the pond. 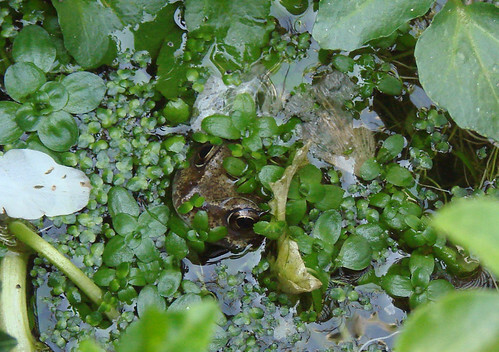 I liked this one lurking amongst the duckweed. 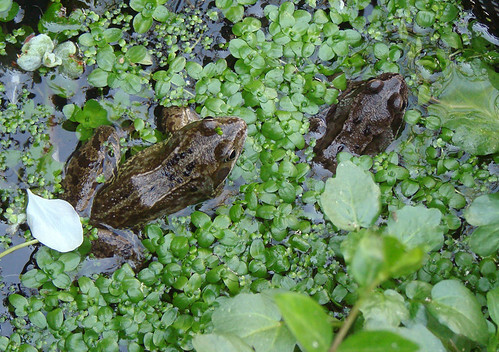 Good numbers of Common Toads + a small number of Common Frogs in a woodland garden near East Finchley. I see plenty of newts, but rarely swimming across the surface like this one was, too busy taking quick pics to look closely at the time but don't remember ever seeing a lumpy one like this before. What's likely to be wrong with it? "If you find a newt that has lumps/growths on the skin please get in touch as our research partners at the Institute of Zoology may be interested in hearing about this." I've emailed them today with the location and a copy of the pic. 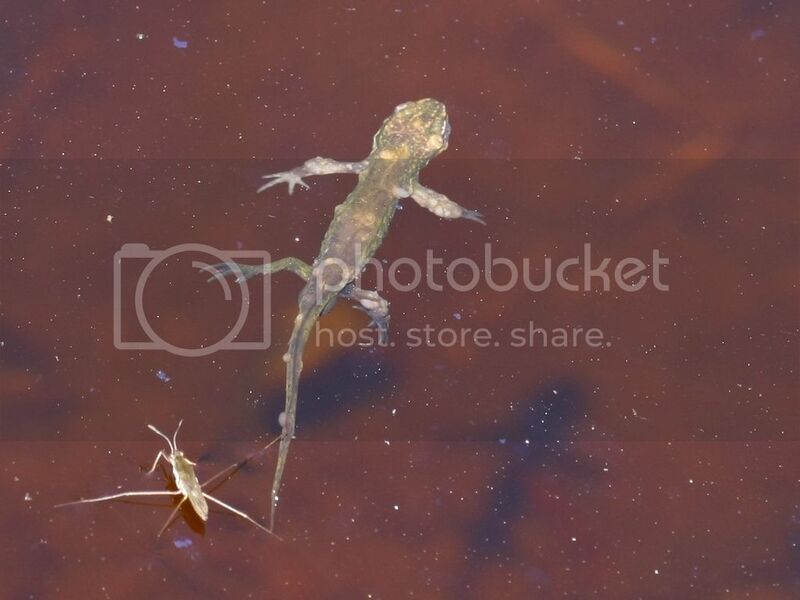 I had a response to my email which sent me off to the "Garden Wildlife Health" website to report this newt. After a protracted trawl all around the site to find where to report it it eventually sent me off to the BTO website which wanted me to register in order to report the newt, which I did, and that then wanted me to log in to go any further which it then wouldn't allow. I gave up having spent a good twenty minutes at it by then. The original email reply did say I'd be offered the opportunity to "submit a specimen for post mortem examination" - not sure how I'll ever find that newt again unless it's snuffed it by now and is just lying there waiting for me to pick it up. I don't think they're living in the real world, it might work alright for garden stuff, (which is what it seemed to be aimed at), but it all got way too complicated for me. What a shame... I was hoping you might be able to find out what was wrong with it. I think with some of these sites, the owners and the website designers are on different wavelengths. Anyway, hopefully there's nothing too wrong with the newt and it recovers. Finally saw some native reptiles today in the North Downs with under tins a smallish Grass Snake, 6 juvenile Slow Worms + a Common Lizard. 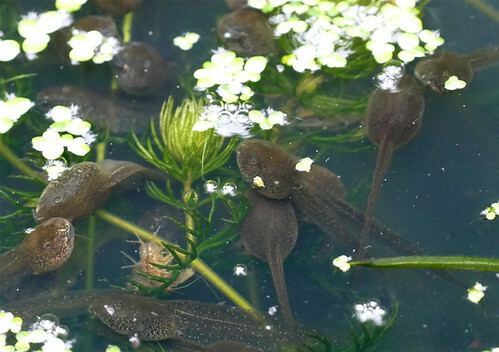 The tadpoles are doing well... started them on a few slices of cucumber a few days ago, which they really like! A plump Common Toad under a tin today. Yesterday - a Common Frog in our local Nature Reserve not far from a dew pond, not unusual to see but this one had a lovely piece of Midland Hawthorn blossom on the top of it's head - a very pretty pink picture except I hadn't got my camera. Trying to skim off some of the duckweed this morning, and caught a glimpse of the newt... pleased it's still there, I'd hadn't seen it in awhile. Several froglets at Ruislip today. An adult Slow-worm + a young Grass Snake which I was surprised to find under some tins given how warm it was.